I remember WillyB posting something once about giving Credit. I created this forum to help out others. I try to give as much detail to those wanting to build their own mod. It's all here for the taking so guys, enjoy. Alan does the same, he shares with all of us. So, Peace brother modders. Let's all get along and play nice. It's one thing to build someone's design and make a comment about the success of the build, but its another thing to post that success in another forum away from the eyes of the designer and 'imply' that the design was his own by not giving credit where credit was DUE! What if someone were to plagiarize the juice me up software and call it their own creation? Maybe even attempt to sell it? Would I still be too harsh in my judgement? They said adios to me when I tried to disclose all of the manufacturers contact names, e-mail addresses, and purchasing terms for 'sample' buyers.....FOR FREE! Bypassing every supplier on the ECF and giving everyone a chance to buy direct from the manufacturer! Cuz if he were to show himself in here, he bombarded by those of us that feel Dave deserves an apology and/or giving him credit for the design. So if my opinion is too harsh for some and I'm the 'bad guy', so be it. I call'em like I see'em. Let me know when this mod goes up for sale please. I don't know if you are aware of it but SS is selling them on ECF. I also see he is a member here on breaktru forum. This is where he got the idea. I ordered the parts to make a .44 mini booster, I have a question about the caps. Do you recommend leaving off the caps? I also see a member here ask for the parts list and made it and is selling it with a different box mod name at ECF. Didn't see a reference to your mod though. I recommend that you put the caps ON. I've seen a difference with the 14500 batt. A big thanks to Breaktru for sharing his design and instruction on this mod. A few weeks ago I didn't know what a regulator did. I put this together and it's working like a champ. Didn't think I'd be able to solder all the components to the pins so I cut up some strip board and soldered to that. The spacing of the pins won't fit into a single board without a lot of bending, so I used three bits and wired the ground lines together underneath. Managed to fit an LED in the end so I can tell if it's firing correctly. Not planning on making and selling them as my own. The cost of shipping the chips to Australia is too restrictive. Very nicely done tea, good work mate. Enjoy your new mod. Wow Tearocks, that looks sweet. Your mod came out fantastic, nice and compact too. Cool mod. Looks great. How does it preform? What voltage range did you end up with Tearocks? Or you could always go with National Semiconductors regulators, available on Ebay, check out the "poorvari" schematics .. should be able to build mods with locally or ebay available parts. Thanks guys. It's quickly become my favourite mod. Small enough to take out and about and battery life has been good, so far, with what most vapers would consider light to moderate use. 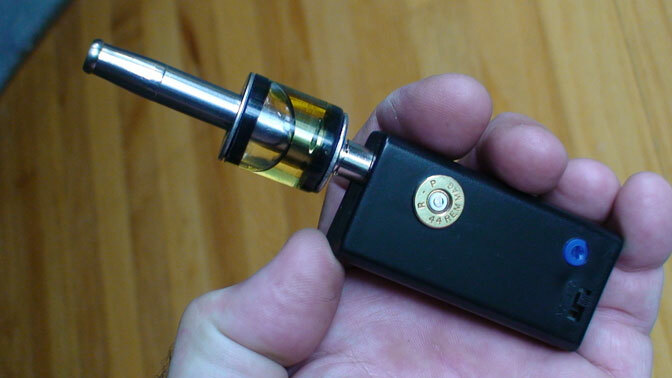 14500's are small and easy to fit a spare with juice, atty, carto, etc. in a Riva carry case. I used the 22K bridge resistor as per Breaktru's table. It will wind down to 4.05V and out to 5.5V without load. I ended up not using the 3A diode because it's large (have to grind the wire to fit into the Vero board or use a flying lead) and I have a simple 3.7V 2AA box mod for the 1.5ohm atty's I have. Thanks for the tips Alan. I've read a lot of your posts and they're always helpful and informative. We have distributors for TI chips in Aus but they charge a premium and I would be better off placing a large order with Digikey or the like to make postage worthwhile. I can get the "Poorvari" chips for ~$3 over here. I will try them out soon but have purchased a few UCC283 chips from ebay to make some VV mods for my family and friends. See the 3rd posting, Reply #2 for update info and Mosfet Touch Circuit. just a quick question, i'm getting the gist of the mod, in fact planning to build one, but what's nagging me, is that can we remove the diode? and if we do, what's the difference? for a voltage range of 4.02v to 5.4v with NO load." Also there is a Chart for voltage ranges w/ or w/o diode. I thinks that 4.02v to 5.4v is a pretty good range. I think it's wonderful that breaktru is sharing all of his mod designs. Good luck Ginjo, let us know how you make out after the build. sweet! can handle LR? what resistor did you used? Look at Reply #2 in this thread. 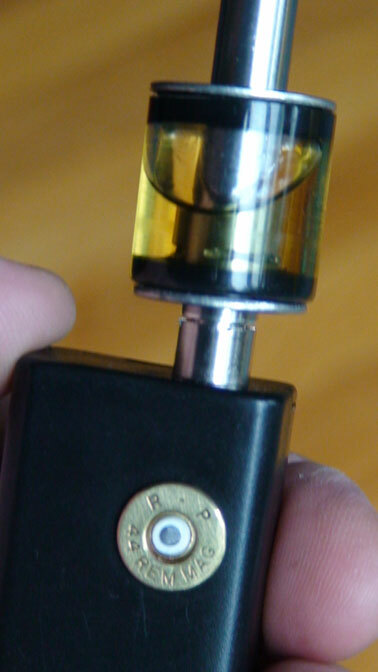 Use a wire in place of the Diode between Pin #4 and the Atty center pin. Everything is the same. Also look at the table for Voltage/Resistor in the previous posts. oh, and i've been meaning to ask, will this work with trustfires without any problems? 1 x 14500, 900mah. Imagine it would be even better w/ a high drain batt. UPDATE: 1/2 amp more wattage with an AW IMR but half the battery run time than the flames. The juice tank is a perfect match for your new .44. Wow. Where did you get it? I made it CV. See my tank mod thread. Also take a look at asnider's CE2 tank mods, they are great too. I've been vaping a 1.5 DC smoketek.The setup with the resistor across Pin 3 & 4 limits the amperage for use of a max of 2 amps before cutting out. Using the 1.5 DC at 1.75 to 1.99 amps produces a significant amount of vapor. It sounds low but I find it satisfactory. Using a standard atty 2.0 -2.2 ohms does NOT drop the output voltage more than 0.1 v.
The attached photo is a quick adapter for setting amperage. Used between the batt connector and the atty/carto w/ the meter leads attached to the studs w/ meter set on 10 amp scale. To summarize: The best way to adjust the 0450c in my opinion is with AMPERAGE and NOT voltage. Dave, is it ok if I use your wiring diagram and expertise to build a TI booster mod? Thanks dude! That's awesome!!! Of course Alan my friend. Hey, I just got in a NEW type DC-DC converter that may put the 04050c out of business. It's half the size. V.V. 10 amps/50Watt - Input 3-13.8vdc and Output of 0.59-5.1v. I have to run some tests to see if I can boost it up with one battery. I read that I can if I wire it differently. And for now as to what it is.... it's a secret.... Sssssssshhhhhhhhhhh. Okay, my dreams of finding the ULTIMATE booster has been squashed. I contacted Design Support over at Digikey and was told that this DC-DC converter has been revised and is no longer a boost/buck but just a buck and NO converter can do what I want, except the 04050c. I was basing my possible design on Rev. 02 and a posting at an electronics forum of a member who successfully used it as a booster. Rev. 03 has limited my intent. Here's what I had used when I bought it. As Emily Litella (Gilda Radner) would have said..... "Never Mind"
HI what would the circut look like if I were to use a small tact switch instead of touch? I've seen many different resistor values for the mosfet using a tact switch. Some use no resistor on the gate while others use a 1k ohm. The resistor between Gate and Source has been shown with a resistor ranging from 47k to 2.2 Meg ohm. How are your making out Dave.. did ya making any more? My tongue is hanging out too..